I love this dress. Well made and beautiful in color. The wrap middle helped me hide somethings as well. Click here to view our modern sizing guide. Loe this dress, to dress up or down this one can do both, and very comfy! Hello, I bought this dress to wear out to a jazz dinner with my husband and i loved it and he did to. It fits great and the color was just how the pictured looked. I wore it with gold shoes and gold jewelry. Very nice length as well. I did not like the dress at all, however other people sure liked it?? Well, I did love the color, however it is so thin, you can see right through it, so I'm not sure if I would recommend it or not??? Fits wonderful, drapes nice and overall is very flattering. Was "pinker" then I expected as my computer showed it as more "orange". Definitely will buy other clothes of this designer from overstock in future. This dress is very comfortable. However it will show if you have flaws on your body due to the color. If it was a dark color , this dress would be georegeous. You must be thin or have no cellulite on your derier because it lays right on your bottom. No biggie, just wear an undergarment that takes care of that and your good to go. The dress fits well but is too long for me -- I had to alter. Other than that, the color is nice and it does not wrinkle, feels cool on a hot summer day. I ordered this dress for a wedding and received many compliments! It is comfortable and fitted. I had to get it hemmed though, it was long and the neckline was big as well. Overall this was a great choice! I love the color! The dress is comfortable and fits great! The other reviews helped me to choose the right size for me! This is must have dress in your wardrobe. Petites and Juniors will love this design. The color is gorgeous. It can be casual or dressy by just using the right accessories. Enjoy! This is my favorite spring dress. 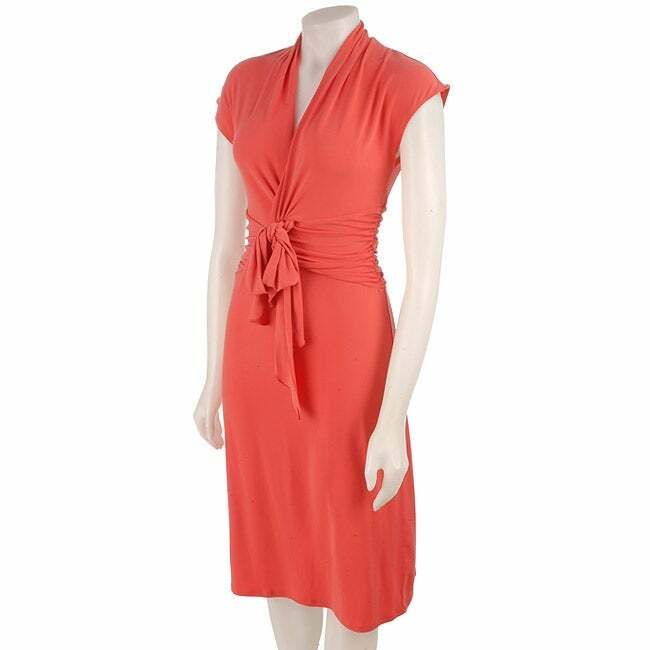 The coral color is very flattering and the fit is great. I usually wear a 4-6 in dresses and the small was perfect. The first day I wore the dress, I had compliments from every person I met. Definitely a good buy! Beautiful color and material. It drapes perfectly, very unique neckline. Love this dress! I bought this dress to wear to an outdoor wedding and added gold shoes, purse and accessories to dress it up. I go so many compliments, and told everyone where I got the dress from. One thing I would suggest is that if you are not in 'perfect' shape you may want to wear some undergarments that smooth your shape since the dress does cling to your figure, and a low cut bra. I wear a size four and this dress came in size small. The small was rather large on top so if you're lacking in that area at all this isn't the dress for you. It was also a bit longer than I thought. The material was nice and a lovely color. If it had fit I definitely would have kept it. I really like the dress. It fit great, and I love the color. Definitely worth the price. I do agree with another reviewer about the fabric though - it does show every little "lump and bump", but other than that, I love it. The fit is flattering and the color is beautiful. At first I was concerned that it would be too bright but it is a stunning shade. The fabric is very nice and the dress has a very flattering fit! It is also a beautiful shade of coral--true to the picture. However, the fabric is a bit clingy, so if you have any lumps or bumps--this dress may not be the best choice to hide them! I ordered this dress for a wedding...I received rave reviews afterwards.